Linen House was founded in Melbourne, Australia in 1993. Specialising in homewares, Linen House produces an extensive range of bed linen, sheets, towels, cushions and coordinating household accessories. Today they are regarded as one of the most innovative and fashionable designer bed linen and homeware brands nationally and overseas. Their textile artists, graphic designers and stylists create many beautiful collections to ensure they cater for a range of individual styles and global markets. 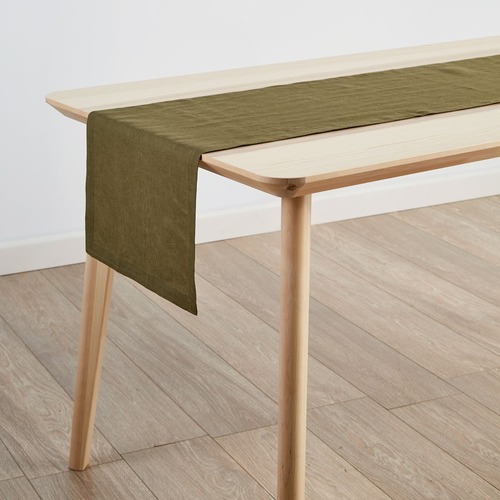 When you buy a Olive Nimes Linen Table Runner online from Temple & Webster in Australia, we make it as easy as possible for you to find out when your product will be delivered to your home in Melbourne, Sydney or any major city. You can check on a delivery estimate for the Linen House Part #: 01067E350 here. If you have any questions about your purchase or any other Dining & Table Linens product for sale our customer service representatives are available to help.Whether you just want to buy a Olive Nimes Linen Table Runner or shop for your entire home, Temple & Webster has a zillion things home.